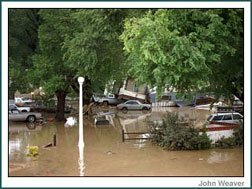 While many of us may have forgotten what rain looks like this summer, historically Fort Collins and the surrounding areas have had several major floods that devastated the landscape. Most of us can still recall the flood in July of 1997. After several days of rain beginning on July 27, Spring Creek exceeded its banks in the evening of July 28 causing a train to derail. CSU had almost 500,000 books damaged. Five women lost their lives in the flood. It is still amazing to look at the high water signs on the Spring Creek bike path! A little further back, on July 31, 1976 a massive thunderstorm created a devastating flash flood now known as the Big Thompson Flood. 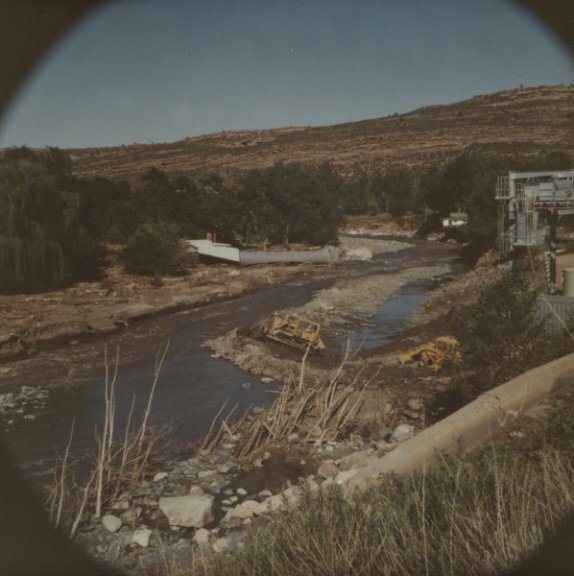 The picture below, found in the libraries History Connection archives, depicts the aftermath of the 1976 flood. 144 people died. The Big Thompson River has had several other flash floods, though less damaging than in 1976. In both 1965 and 1999 individuals were evacuated when the Big Thompson River began to overflow its banks. There was also a destructive and shocking flood in 1904. A flash flood that was described as being 14 feet high came through Poudre Canyon. 150 houses and 15 bridges were destroyed. The Chambers Lake Dam was also damaged in flood, adding to the overwhelming destruction. The City of Fort Collins has done improvements both with infrastructure and a flood warning system. But, it is considered just a matter of time before another large storm creates the possible conditions for another flood to threaten our area. Time to buy a raft? *To learn more about the 1976 Big Thomson flood view the Fort Collins Coloradoan’s presentation. Great info about the Big Thompson flood. Is there a similar link to information about the 1997 flood? Recently neighbors were discussing the flood and they had forgotten about the train derailment. . . Thank you for the great link, Paula. Even though we live on the banks of Spring Creek, we don’t own a raft, kayak or canoe. We do, however, buy flood insurance every year.